Today I am going to share a most crying needed thing with you. 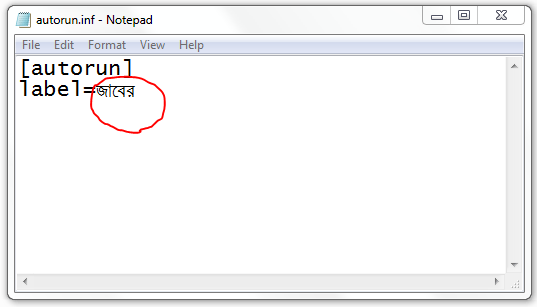 A few days ago one of my friends asked me “How can I give Bengali name to my pen drive?” That time I could give him solution on it. So I was thinking to write on it to know it other people. But why to write on “Changing pen drive name”?. Is there any problem to give it name with another language/font instead of primary supported alphabets? Yes there is a problem. Let’s discuss how you can do it. Normally you cannot rename your pen drive with non-supported codes of fonts. If you try to use non supported characters, it will show the following error : “The drive label is too long or contains invalid character”. 1. Just follow all steps to create an autorun.inf file inside your pendrive at “How to Change The Icon of Your USB Pendrive or Removable Disc“. 3. After giving your custom name, don’t save the file directly clicking on Save. Go to File > Save As . Now choose Unicode as encoding. Then save. 4. Please remember to save the file as autorun.inf . Don’t save it as autorun.txt or autorun.inf.txt or autorun.txt.inf . Otherwise the whole procedure will go in vain. 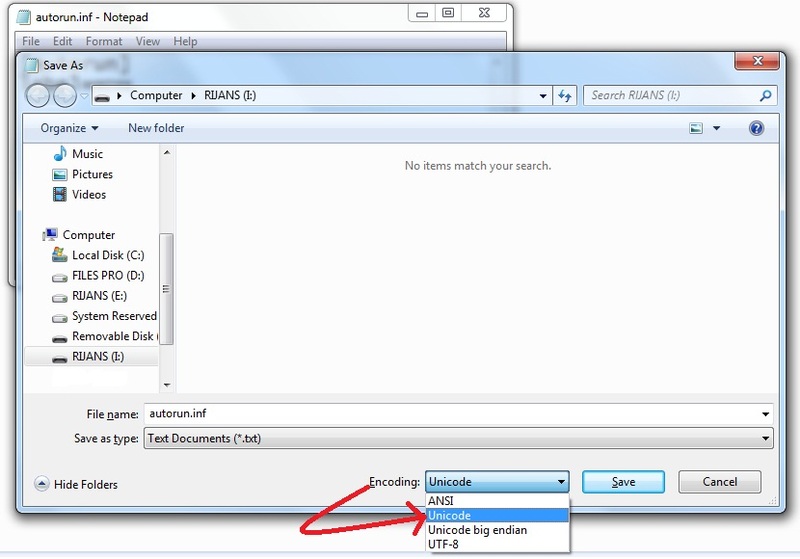 If you still have confusion to create the autorun.inf file from text document, please read carefully How to Change The Icon of Your USB Pendrive or Removable Disc” where I made a little but clear describe on creating autorun.inf file for pen drive to add extra functionality with your pen drive such as changing icon. 5. Now save the autorun.inf file in the root of your pendrive. 6. Plug out the pen drive from your computer. Then again plug-in to the computer. Now see it’s really working! 1. Autorun.inf files are used by viruses to spread. So your antivirus may delete the file. So to work with it, you may need to stop your antivirus. 2. The autorun.inf file must be saves as Unicode. 3. This procedure only properly works on windows as autorun feature is introduced by windows. The icon feature may also work on Linux and Mac. If you have any problem regarding to this, feel free to mention that in comments. TechGainer is ready to help you. is there any way how can i use autorun.inf file with out stooping my Antivirus ….? Many anti viruses has an option to exclude files from their scan. You should check that with your antivirus. I like TechGainer Website very much,So why I used to Read & Download the Articles from this website when I am free. Wow… let me check it out i need all these again from tech…. I was also reading a topic along the lines of this one from one more site. but after formatting pendrive,its not working. Greatt!!! It worked for me!! thankx a lott!!! Good to know it worked!